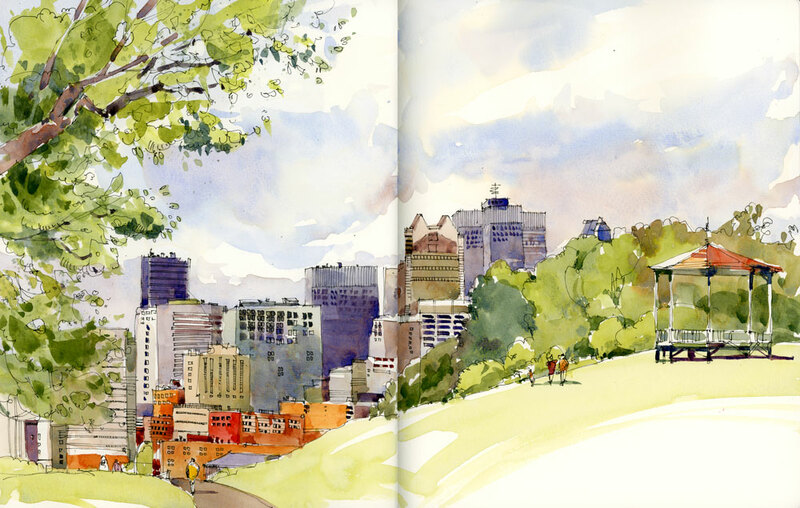 In Montreal we’ve had such a miserable, rainy June but the sun finally came out today just in time for the monthly outing of our Urban Sketchers group. We have been trying, without much luck, to get to the mountain to sketch the tamtam on a Sunday and it was finally nice enough outside to plan an outing there. The drummers don’t appear much before noon so in the morning I did a little Barcelona practice sketch with my limited palette of Ultramarine, Alizarin and Aureolin. In the afternoon Marc gave the group some great exercises and tips on drawing people in motion as a practice for his workshop in Barcelona. You’ll notice that I didn’t post my people drawings because I am really RUSTY. Need to get out and do a bit of that this week but this was a great start and it got me very excited for the Symposium. They seem to be well-coordinated, these little dinghies in the Rockport Harbour. One of every colour, just waiting to be painted. I thought this would be an easy task because the water was fairly calm but every time I looked up from my sketchbook they would all have moved — ever so slowly, ever so silently — so that by the time I got around to putting in the colour I had to do all the shadows from memory. Here’s another sketch of the Tarr and Wonson paint factory in the afternoon light. From a distance you can’t see many details but it has a beautiful silhouette in deep reds and purples and makes a great contrast to the blue and green surroundings. The little lobster boat went by and I decided to quickly add it in but wish I had captured a few more of the details. If you sit and watch for a while you realize that there is a constant flow of fishing boats filling up at Cape Pond Ice in Gloucester. 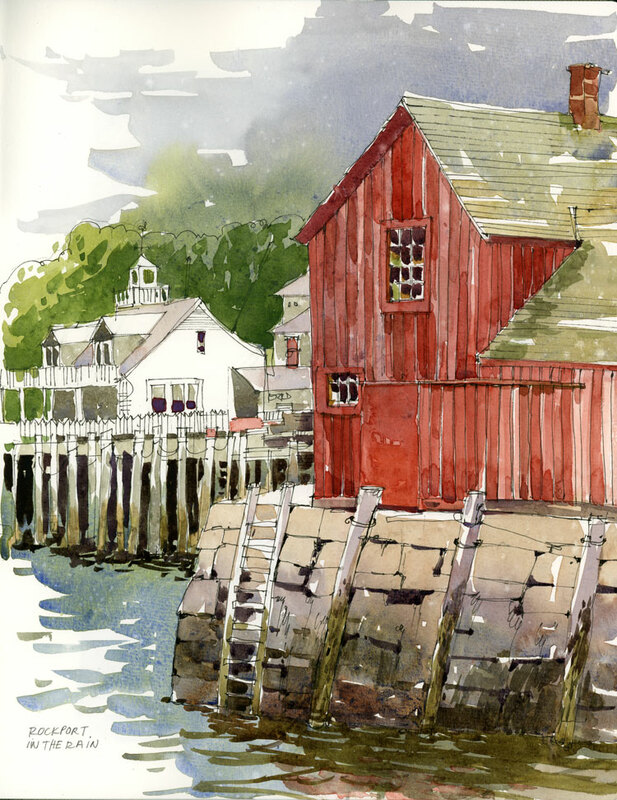 Across the bay (on the far left in the sketch) there’s the historic Tarr and Wonson paint factory, best known for developing a copper paint used on the bottom of boats to prevent barnacles. I painted this building several times from a distance but never got really close to it like I had hoped to. I have to leave something to sketch for next year! You can probably guess what attracted me to paint Pigeon Cove. 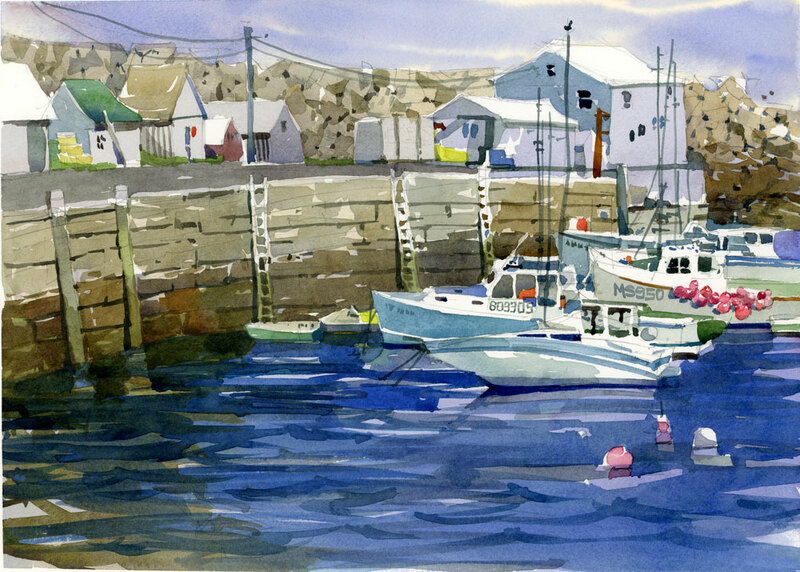 A working fleet of lobster boats, tiny fishing shacks, and a wall of stone as a backdrop. But painting there was hard work. Despite the wall, the wind blew at me the whole time and I spent most of the time muttering to myself and wondering why I had picked this place to paint. I don’t usually paste things into my sketchbooks to remind me of what I did on a particular day but I love how the raindrops played a part in my memory of sketching this scene. It was really the only rainy afternoon I had during my week in Rockport. The rain started moments after I set out to sketch so I found a sheltered spot with a great view of the harbour and the back of the iconic Motif No. I. Even though I was under an awning, the wind drove the rain onto the still damp washes in my sketchbook. There was also a memorable moment when a waiter, on a break from a restaurant nearby, took shelter in the same spot. I can confirm my theory that as sketchers we are often invisible to others as we work because he then proceeded to make a very intimate phone call to his girlfriend within earshot of my chair and finished his break by smoking two cigarettes in quick succession and flicking the butts into the harbour. Captain Joe is a dragger. (I figured that since I love painting boats I should learn a bit about them.) 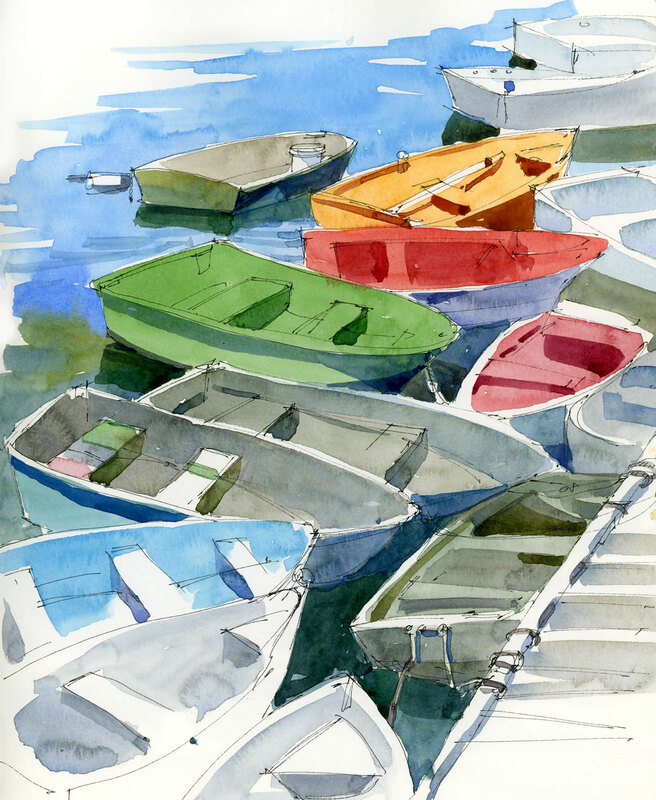 What makes these working boats so interesting to draw? The complex shapes, the textures in the rust, the ropes and lines and rigging, and of course the reflections. 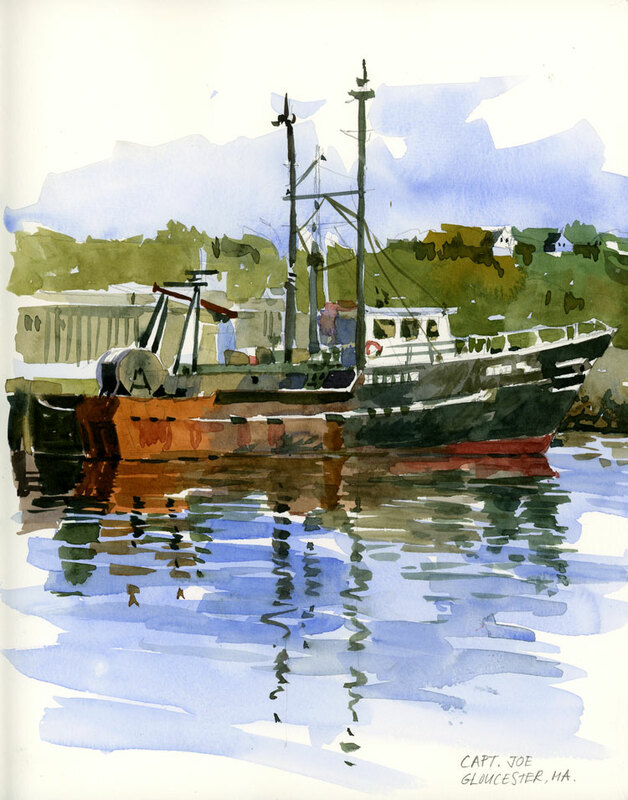 I sketched this in the Gloucester harbour around 6 pm when the harbour traffic was quiet and the water calm.